All Vermont taxpayers, especially those using Airbnb to travel or host, should be concerned about a new tax bill that passed the Senate and is being considered in the House. S204 would force travelers to pay higher prices for fewer places to rest, give less opportunities to Airbnb hosts, and leave less revenue in the state’s coffers. In addition to the per-booking tax that the state began collecting back in 2016, the registration inconvenience is accompanied by a new tax: “a short-term rental unit registrant shall pay to the Department fifty percent of the (lodging) fee required.” Vermont statute indicates that “lodging establishments… (with a) capacity of 1 to 10” have an annual fee of $130.00.” So a single Airbnb unit would cost $65 for a host to register annually, before per-booking taxes. 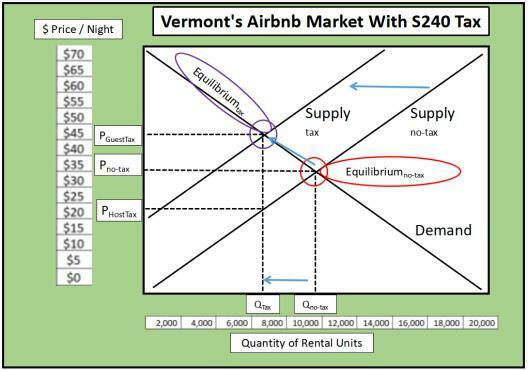 In order to understand how the tax hurts Airbnb hosts and guests despite being only imposed on the hosts, we need to understand a hypothetical market for Airbnb’s in Vermont, as shown in the chart “Vermont’s Airbnb Market With S240 Tax.” The line [Supplyno-tax] intersects the [Demand] line for rental units at [Equilibriumno-tax], indicating that a less-regulated Airbnb VT market would produce a Quantity of 10,000 rental units annually [Qno-tax] , at a price of $35/night [Pno-tax]. Assuming the S240 tax is imposed and hosts are extremely tax sensitive, [Supplyno-tax] will shift left to [Supplytax] toward the new [Equilibriumtax] . This would cause the quantity of Vermont rental units to to decrease from [Qno-tax] to [Qtax]. The quantity decrease is the net result of hosts being less likely to open up their homes and fewer Airbnb guests willing to pay higher prices. If Airbnb hosts and guests are price sensitive enough, we could see Vermont make less net revenue overall if houses pulled off the market results in a severe enough booking decline and accompanying per-booking tax collection decrease. For an Airbnb host that only offers their home for a few nights a year, we can expect them to pass on large portion of the tax to their guests (assuming they decide to keep operating or register at all). In this example, guests, on average, would pay the host $45 per night [PGuestTax]. The state would collect $45 – $20 [PGuestTax] – [PHostTax], which is $25 in this example. The host would keep the other $20 n this example.. In the end, Airbnb guests would have fewer Airbnb homes to choose from, with price increases across the board. We would need far more specific data to answer “by how much?” The state would keep a much smaller percentage if an Airbnb host operated regularly, but that isn’t much solace for occasional Airbnb hosts who pull their home off the market to avoid the tax. While S240 would affect occasional and frequent hosts to different extents, the overall effect would be higher prices and fewer options for travelers. The best policy option would be to reduce spending so that we can eliminate registration and per-booking taxes that serve as entry barriers for ‘extra money’ jobs. The second best alternative would be to eliminate all registration taxes and replace that revenue with per-booking taxes for all B+B’s. Traditional and otherwise. This way, Airbnb, hotels and traditional B+B’s wouldn’t have to bicker about who should have more regulation. We could let the consumer decide, through a clear market signal shown every time a traveler books a room at their choice of establishment. Though S240 is not as heavy-handed as some tax bills, being the “lesser evil” does make it good policy. Enough taxes. I think the state house needs to be taken back by Vermonters. This is an outrage. Am I missing something? The folks in Montpelier have always shouted about how important tourism to Vermont’s economic health and now they want to tax the goose that lays the golden egg. You can’t make this stuff up. They are destined to have higher taxes, fees and surcharges, because they want more government and more programs and the votes that come with that. Most of them have not a clue of the balance sheets of business, or any experience on how to run a PROFITABLE business. They think profits are evil. They think profits must be taxed out of exitance. They like NOT FOR PROFIT organizations, and will use our hard earned money to subsidize them. Thé saga just never ends. When are the fiscally conservative residents of Vermont going to realize that letting the Liberal/Progressive crew continue to run roughshod on our once great state is a no-win situation. When is the Liberal/Progressive crew going to realize that doing just that is not a viable alternative to our American form of democracy? Capitalism may not be perfect, but it sure has proven to be immeasurably superior to Socialism. Local control proved early on to be an effective form of government. Instead of Vermont trying to be at the forefront of leading the nation down the road of no return, let’s return to showing the nation what works best.